We started venturing to Southeast Asia to dive about eight years ago. Over those years, in all the locations we’ve been diving, we’ve noticed an alarming dearth of sharks. Healthy coral reefs need apex predators. Sadly, it appears that most of them have been captured and finned (while still alive!) to feed an enormous and seemingly insatiable Asian market for (perplexingly prestigious) shark fin soup. There are some signs that there is finally some much needed change occurring in consumer habits regarding this product. It remains to seen if is too late for worldwide decimated shark stocks to recover. In fact, in many locations where I have been diving, there are very few bigger than your fist fish left at all. On my ten or so trips to Southeast Asia (over eight years), diving in as many different locations, I’ve seen not more than a couple of dozen sharks, in total. That is tragic. So it was heartwarming to dive the reefs of Palau and see sharks. On. Every. Single. Dive. We spotted white tips, black tips, gray reef sharks and several leopard sharks. So sharky dives were one of the big highlights for me of this trip. Another was the hauntingly beautiful Jellyfish Lake, in which a pocket of the ocean became land-locked at some point in history, and the jellies evolved into non-stingers. This was a snorkel excursion, and spending an hour or so floating in a salty lake with literally millions of these poetic creatures was lovely. Palau is also very fishy, and again, it was so wonderful to see large schools of fish – jacks, and snappers, and crescent-tails, and barracuda, and grunts, and even a herd of bumphead parrotfish. The conservation culture of Palau (that recognizes the value of tourism, and seems to embrace it) seems to really be helping to keep a healthy diversity of animals on the reefs and in the blue. Like I said above, you don’t see a lot of fish anymore in a lot of locations in this part of the world. The reefs themselves are reasonably colourful and diverse (although not as pretty as other places I’ve been – Fiji, Raja Ampat, Komodo etc), and we saw a lot of very large sea fans. Given the amount of divers in the water (it is a very popular dive destination – kind of like the Cozumel of the Pacific), it was amazing to me that most of the fans did not have signs of diver damage. One of these days I’ll rant, er, blog about some of the appalling dive practices we witnessed while there (and yes, I took pictures). It is mind-boggling how careless some divers can be. Chandelier Cave, a very shallow dive, was cool too. The archipelago of Palau (comprised of hundreds of islands and islets) was formed from limestone, and so is very porous and easily eroded. We did several dives featuring blue holes, tunnels and caves. We also dove some pretty vertiginous walls. It was all good. And there there was Blue Corner – a revered dive site, often cited in ‘Top Ten Dives in the World’ lists. Hit it right, and it is magic. Hit it wrong and it can be hair-raising. We did it both ways. Maybe I’ll write more about the ‘dive from hell’ in a future instalment. 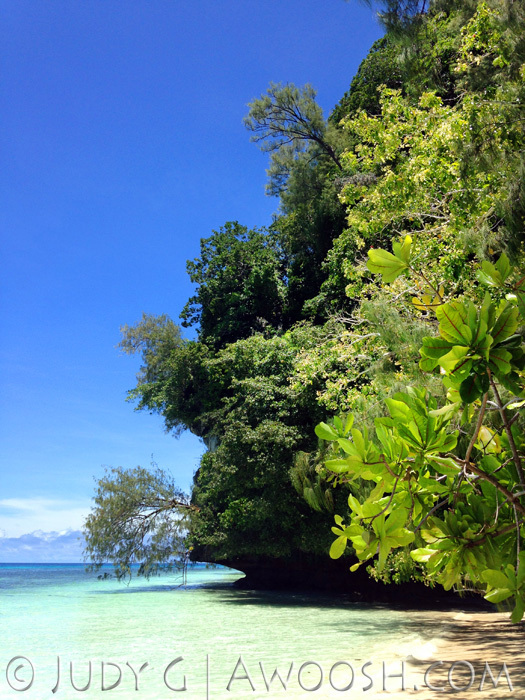 And finally, Palau is about interesting and poignant history. We did a full day tour of Peleliu Island – the scene of one of the major land engagements between the Japanese and the US. I took a lot of pix and plan to blog about it in the coming weeks to share the experience. We had an extra day after we got off the live aboard before flying home, and so we hired a local guide to take us on a cultural tour of Koror, the main island of Palau. It was very enlightening. Just call me Sir. 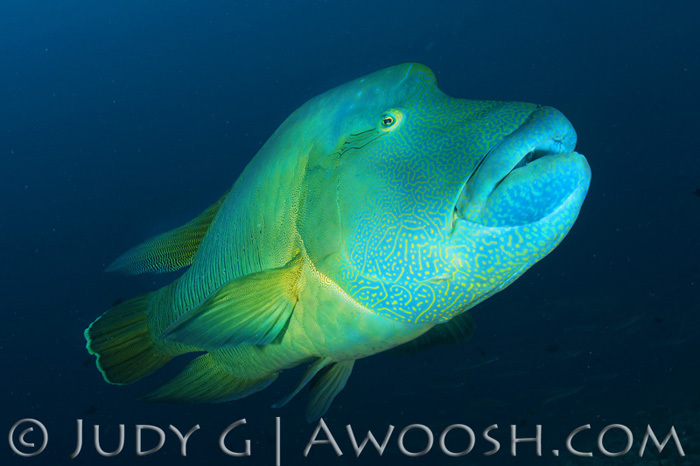 A gorgeous, huge, fairly friendly Napoleon Wrasse at Blue Corner. 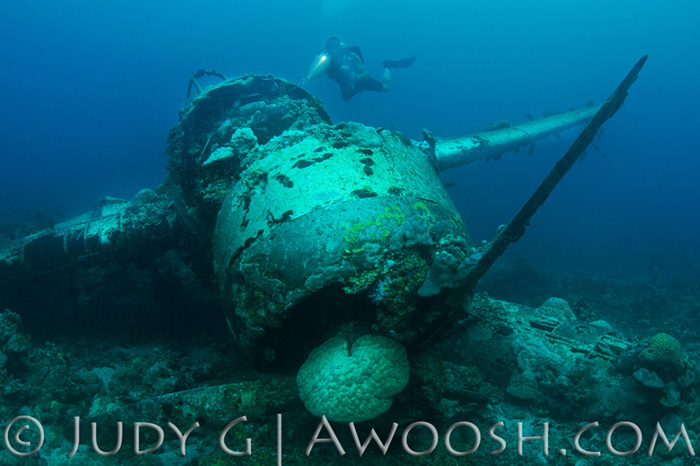 Wreck of a Japanese Jake Seaplane, in shallow water near the main island of Kuror. This entry was posted in All About Scuba Diving, Travel, Trip Reports and tagged Napoleon Wrasse, Palau, Peleliu, Ulong Island. Bookmark the permalink. Our son and daughter in law Jim Peterson and Jami Haberl dove with you on your recent Palau Yrip. I can’t wait to see the rest of your pix.